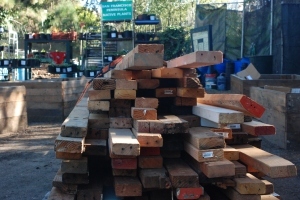 April at HANC will be devoted to a report on the transformation of the HANC Recycling Center into the “Kezar Gardens Ecology Center” and what steps we need to take to make it real and permanent. It is one hell of a story of how a neighborhood organization, using resources from recycling, has added an entire new garden center at no cost to the public, creating a new model of both sustainable urban agriculture and recycling. Come to Park Branch library Thursday, April 12th at 7 PM and hear for yourself the story of this remarkable undertaking. On March 8, 2011 the Board of Supervisors passed a resolution, drafted by then Supervisor Ross Mirkarimi, calling upon the City to work with HANC to “establish a comprehensive Parks recycling program utilizing the expertise, volunteer base and facilities of the HANC Recycling Center in Golden Gate Park, … to establish an Independent Recycling Center Master Plan” and to implement the Golden Gate Park Master Plan by integrating recycling and education programs into the park. The Resolution also called upon Mayor Lee to urge Recreation and Parks to negotiate in good faith to allow HANC to continue to serve Golden Gate Park (click here for full text of the Resolution). Planning ahead for low-maintenance design and sustainable products is a key element to a successful organic garden. Join us to learn about natural maintenance practices that will keep your garden beautiful and your labor to a minimum. More info here. Water is vital to garden health. But, when is enough, enough? Join us to learn earth-friendly ways to water the garden and the most efficient practices for the Bay Area’s Mediterranean climate. More info here. CITY CHICKENS! And Ducks Too! Mendel's opened on Haight Street in 1952, by its founder and namesake, Mendel Herscowitz. It has operated continuously and family-owned since then. The original store (called U-Save Paints) was at the corner of Haight and Masonic. It moved to its present location between Clayton and Ashbury in 1968. Bette bought the business from Mendel in 1978. Running stores is kind of in the family blood. Mendel had a "five-and-dime" store on Haight Street in the early 1950s (called B&L Five-and-Dime--named for his daughters Bette and Louise). Niece Naomi now helps Bette run the store. When Bette is ready to retire (which means work only when she wants), Naomi will be in charge. The store is in a constant state of change. When Mendel first opened the store, he sold house paint and linoleum. Times changed, and so did the merchandise. Today, Bette and Naomi like to think that they are "the complete store for the creative individual." The defining factor is that they sell products for you to do stuff with. Why sell a tie-dye shirt when they can provide you the dyes to make your very own original design? Why sell a necklace made of clay when you can make your own necklace design from supplies available in the store? Creativity is good and healthy and the goal is to encourage you to find your own personal outlet, a goal established by Bette's mother, Sarah Herscowitz. 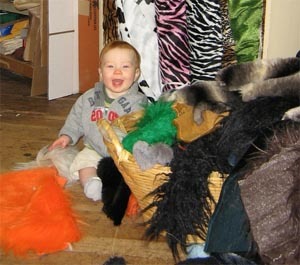 Bette and Naomi have a ton of fun running the store--laughter ought to be a good part of the creative experience. They are dedicated to an "old school" way of running a store, with fun and personal interaction with customers enhancing a creative and supportive work environment--and it works. In these days of chain stores, Mendel's remains an independent retailer and we want to encourage you to visit and support your local independents. Bette has a wealth of wonderful hisotry of life on Haight Street and when asked, as she frequently is, how things have changed, she agrees that "the more things change, the more they stay the same." Business has been good through good times and bad int he wider economy--they must be doing something right! Visit Mendel's website and Facebook page. Redistricting - Why Should You Care? Wednesday, April 4, beginning at 6 pm, at City Hall, Room 406. For more detail about this meeting, click here. Through the advocacy of hundreds of community members, the Redistricting Task Force Map (as of 3-22-2012) has progressed a great deal from where it started and now looks close to our Community Unity Map (pictured above and described below). We need to keep the pressure, reminding the Task Force of the good work they are doing, and pushing back on new cynical maneuvers from real estate interests. The April 4 Task Force meetings will literally shape San Francisco's future beyond the next decade. Please join us at this meeting and tell others! Why do we want you at this meeting, and why should you care? The short answer is that revised District boundaries could ultimately mean the loss of District elections and the loss of rent control. 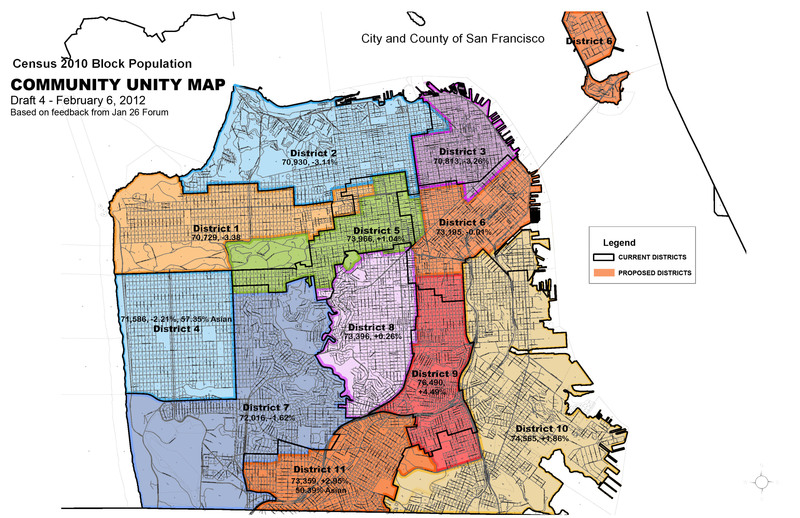 Downtown interests (such as the Realtors Association and the Chamber of Commerce) want to make Districts 5 (Haight/Western Addtiion), 6 (South of Market / Tenderloin) and 9 (Mission / Bernal) the only progressive districts. This could result in a permanent 8-3 fix for downtown and business interests. Those who remember the days when Tom Ammiano and Sue Bierman were the only progressive votes on a citywide elected Board of Supervisors know how serious this could be. A couple of blatant examples of this kind of gerrymandering include a proposal to move Seacliff (a conservative voting bloc) out of District Two (which it shares with the Marina) and into District One (Richmond), or moving the western boundary of D8 to include Twin Peaks. A very interesting project was initiated in our neighborhood last year. There was a request from neighbors for the SF Metropolitan Transportation Authority to address traffic issues of speeding, pedestrian visibility problems and crosswalk issues. 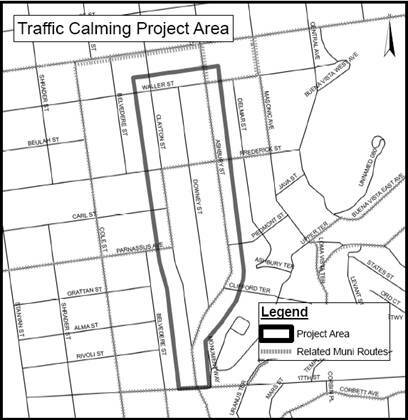 The project area is Clayton, Downey, and Ashbury Streets between 17th Street and Waller Street, as well as Frederick and Waller Streets from Clayton to Ashbury Street. There were two community meetings and two small committee meetings. Most of the people who attended were long time residents with a variety of concerns. A number of suggestions came out of these meetings, including speed humps and cushions, corner bulb-outs, painted and mountable areas at some intersections, red visibility curbs near intersections with stop signs. There were two alternatives for the dangerous Clayton and Ashbury intersection. People interested in this project can visit the website here. What is Bound Together Bookstore? 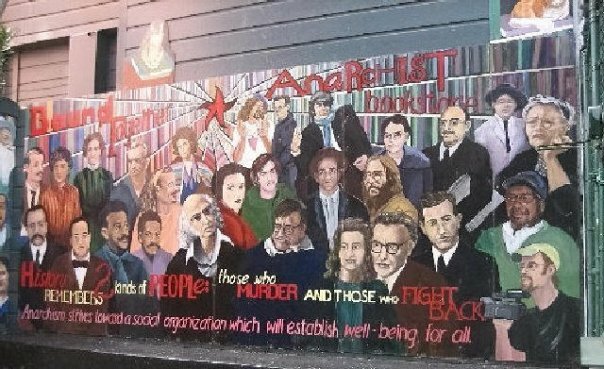 Bound Together Bookstore is an Anarchist collective-run bookstore featuring radical literature and events. History, politics, feminism, LGBT, fiction, and Noam Chomsky are major subject categories and available new or used. Bound Together Bookstore was founded in 1976 to provide hard-to-find books on urban do-it-yourself subjects, such as bicycle repair. The collective gradually realized they shared a common belief in anarchy and added this focus in 1983. What is anarchy? There are many flavors of anarchy, but the general understanding about anarchy is that there is no leader [an=without, archy=leader]. The collective has about 15 members, operates by consensus, and is open to new members. They volunteer their time to operate the bookstore. Joey Cain is both a member of the collective and a HANC Board member. The collective hosts discussion groups and speaker events, including the Anarchist Book Fair with numerous speakers (this year, Saturday, March 31, 10-6 pm and Sunday, April 1, 11-5 pm, at the County Fair Building in Golden Gate Park, near 9th Avenue and Lincoln).